The global wearables market grew by as much as 10.3% in 2017 with Apple taking over the top position in market share due to a surge in smartwatch shipments according to IDC. Behind Apple in the top five are Fitbit, Xiaomi, Garmin, and Huawei. While 10 percent sounds pretty good, it is a significant decline over the previous year in which growth was pegged at 27.3% Despite the drop in growth, we should expect to see major upgrades in the next generation of wearables in respect to device design, components, features, and the services developed around wearables that make them such indispensable part of people’s lives. The market for wearables should continue to grow robustly in the coming years, IDC expects a nearly doubling of shipments from 113.2 million in 2017 to 222.3 million in 2021. While wristbands have led market share in the past before 2017, smartwatches should lead the market in the near term. Smartwatches alone should grow from 61.5 million shipments in 2017 to 149.5 million on 2021. In addition to these two categories, other areas worth keeping track of include smart earwear and smart clothing and shoes, which IDC expects should see CAGR growth of 58.5% and 48.7% respectively. Body-worn wearables should expect minor growth. Aside from growth in the wearables market there are a number of trends to look out for in the coming year or two. New smartwatch features and design are expected. Some point to the possibility of Apple introducing a round smartwatch to more mundane component and service innovations that could lead to more intelligent watch features and more advanced services built upon them. This may also take the form of smart watch bands that enhance the features of smartwatches themselves or perhaps traditional mechanical wristwatches. 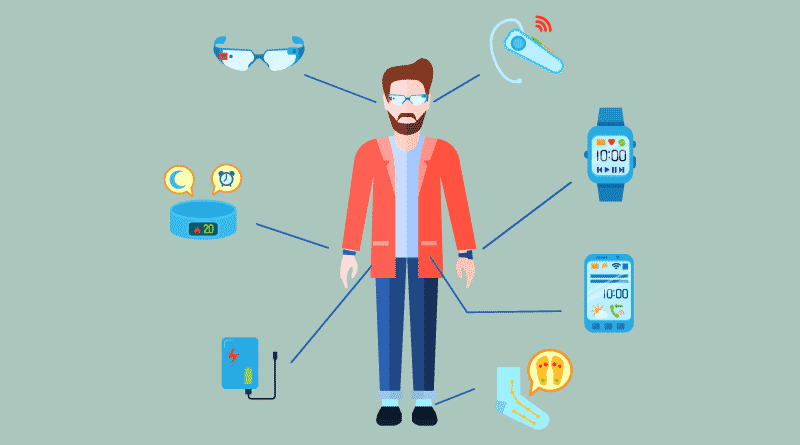 The combination of healthcare providers, insurance companies, and relaxed FDA regulations for wearables together with needs of patients and consumers generally looking for better wellness could help drive the development of wearable IoT and services. Healthcare wearables promise considerable opportunities for improved patient condition and vital tracking, disease diagnosis, time and resource efficiency. Enhancements in wearable data collection and analysis with the aid of AI and machine learning should also lead innovation in this sector. Another area that should see significant development is wearables that are used to for safety and protection of women, children, the elderly, and workers (especially in more dangerous work environments like construction, mining, and manufacturing). Development of this category of devices could be led by advancements in the development of sensor modules, RF modules (Wi-Fi, cellular, BLE, and LoRa, etc. ), and microcontrollers as well as services. Now that we’ve taken a brief look into market growth expectations and potential trends, we might want to look into the wearable IoT development supply chain. To realize the wearable product, you will go through the electrical design and mechanical design. Meanwhile, you may need consultant’s support to help you solve technical issues and understand how to negotiate with suppliers. In addition to hardware itself, software is another critical part to make your wearable solution work smoothly. Here we’d like to use a simple definition to help you understand each element in the product design process. Component & Power: the basic discrete device or physical entity in an electronic system used to affect electrons or build a flow of electricity, e.g. MCU, Connector, battery, etc. 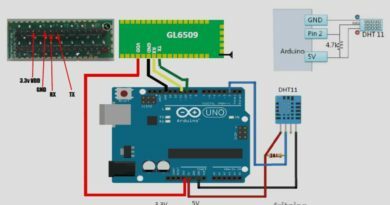 Circuit Design: The process normally begins with the conversion of the specification into a block diagram of the various functions that the circuit must perform, then the individual circuit components are chosen to carry out each function in the overall design. 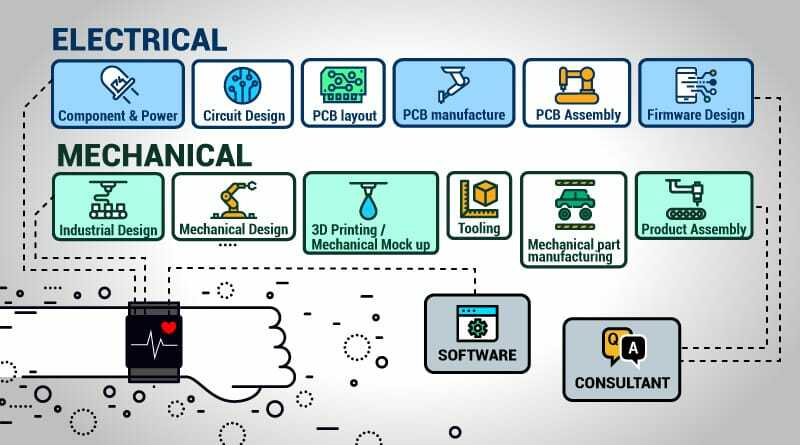 PCB layout: This process is to transform the electronic circuit to the PCB which mechanically supports and electrically connects electronic components using conductive tracks, pads and other features. PCB manufacture: The process is to etch the conductive tracks, pads and other features from one or more sheet layers of coper laminated onto and/or between sheets layers of a non-conductive substrate. PCB Assembly: The component can solder onto the PCB to both electrically connect and mechanically fasten them. Firmware Design: To design a specific class of software that provides the low-level control for the device’s specific hardware. Industrial Design: A process of design applied to products by the creative act of determining and defining a product’s form and features takes place in advance of the physical act of making a product. 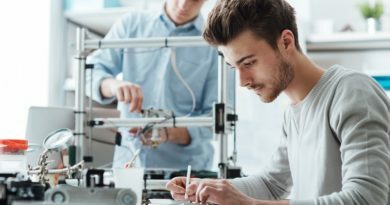 3D Printing/Mechanical Mock up: Any of various processes in which material is joined or solidified under computer control to create a three-dimensional object. Tooling: A manufacturing process to producing a set of mold which can repeatedly produce mechanical part quick and efficiently. Product Assembly: a company which assemble and test the electrical parts and mechanical parts to end product. Computex is a global ICT and IoT exhibition and conference held annually in Taipei, Taiwan and the next one is coming up soon, June 5-9. The event is co-organized by the Taiwan External Trade Development Council (TAITRA) and Taipei Computer Association (TCA) and attracts more than 40,000 international visitors and more than 1,600 exhibitors. While the event covers the full spectrum of the global ICT industry and specifically Taiwan’s complete end-to-end ICT clusters, you’d be missing a significant number of established and qualified vendors to help you develop your wearable product and get it to market. 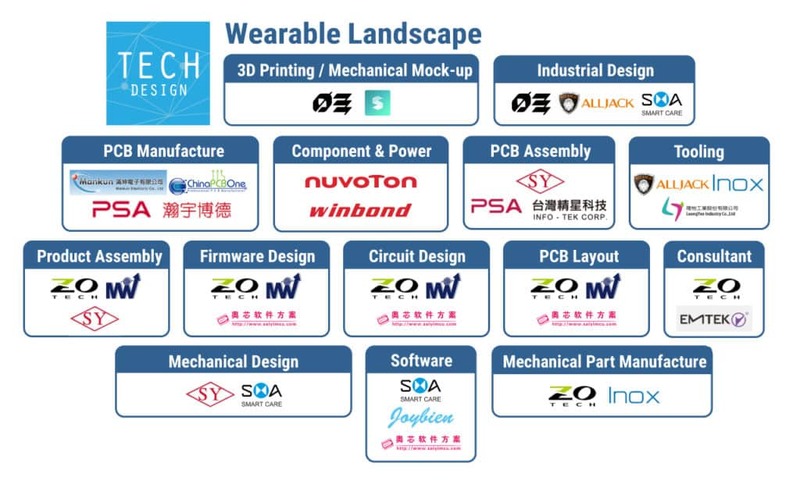 Fortunately, we at TechDesign are looking out for you and would love to share some of the many trustworthy suppliers that make up the wearable IoT product development landscape. Check out our infographic mapping the landscape below and introductions to the respective wearable supply chain partners to learn about their services in more detail. Circuit Design ZOTECH Co., Ltd.
Firmware Design ZOTECH Co., Ltd. Mechanical Part Manufacture ZOTECH Co., Ltd.